Are You Ready for the 2019 M3F Fest? Can you believe that the 16th annual McDowell Mountain Music Festival is less than a few month away? 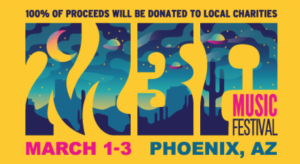 Starting March 1st-March 3rd, the M3F Fest hits Hance Park in Phoenix for an epic 3-day music festival. ODESZA, Empire of the Sun, Umphrey’s McGee, Kurt Vile and the Violators, Lettuce, Margo Price, Big Something, The Knocks, Marian Hill, The Noodles, Nombe, Kevin Morby and more. You can check out the full lineup at the official website. Tickets are on sale now! You can get a single day pass for $60 or get the 3-day pass for $125. VIP tickets are also available for $200 for single day tickets and $540 for the 3-day pass. It should be a gorgeous weekend full of music and fun in sunny Arizona!